Diet and nutrition in animals is a topic for discussion that attracts debate, possibly sparks controversy and often spreads blatantly wrong information. There are plenty of “special recipes” out there for making chickens lay more eggs, prevent broodiness, grow better feathers etc. The best diet you can give is a good quality, commercial poultry food. These have been nutritionally balanced to meet the requirements of your chickens at each stage of life. Laying eggs is demanding and ensuring adequate nutrients is vital to maintaining a healthy bird. Chicken starter is a fine crumble which should be fed to day old to 6 week old chicks and contains 22% protein. 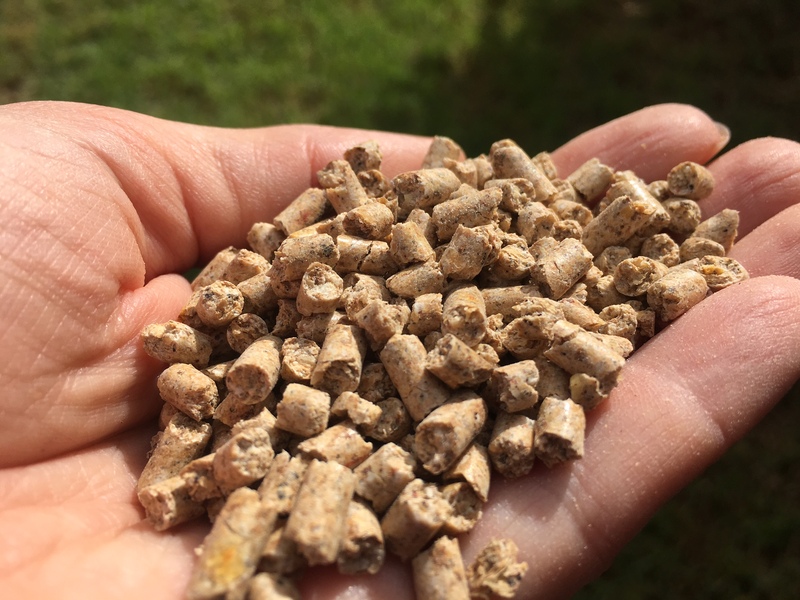 Commercial feeds will also contain a coccidiostat which is important in this age group as they are highly susceptible to coccidiosis, an intestinal parasite. The higher protein content of starter feeds is essential for proper growth and feather development. 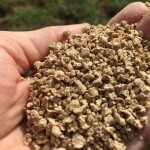 Pullet grower crumble should be fed from 6 weeks to 18 weeks and have 14-16% protein. These also contain a coccidiostat. 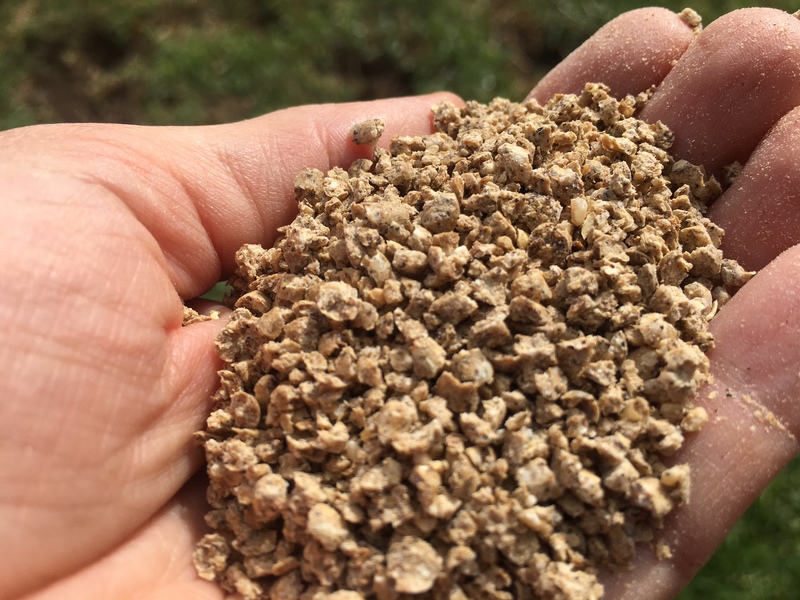 Adult layer crumble or pellets should be fed to adults >18 weeks of age and will have 15-18% protein. Adult egg laying chickens should not be fed a coccidiostat. Some adult chickens will not eat large pellets well, particularly smaller bantams but small size pellets/crumbles are available in the good quality brands which are more readily accepted. 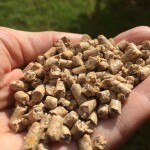 Vitamin A deficiency is a common problem in poultry fed grain rather than good quality pellets. This can predispose birds to bumble foot, a nasty sore on the foot causing lameness, as well as other problems with the skin and respiratory tract. Grain diets are also deficient in protein. A laying hen will eat up to 1kg of feed per week. They should have food available at all times as well as fresh water. Ensure there is space at the feeder for all birds to access so less dominant birds don’t miss out, approximately 10cm per bird. Supplementing the diet with fresh veggie scraps and plants from the garden is great. Watermelon skins are a favourite as are cucumbers, tomatoes, and leafy greens. Be sure not to give spoilt food as it may cause your chickens to become sick. Avoid bread and other processed foods being placed in the scrap bucket. Here’s a cool idea! 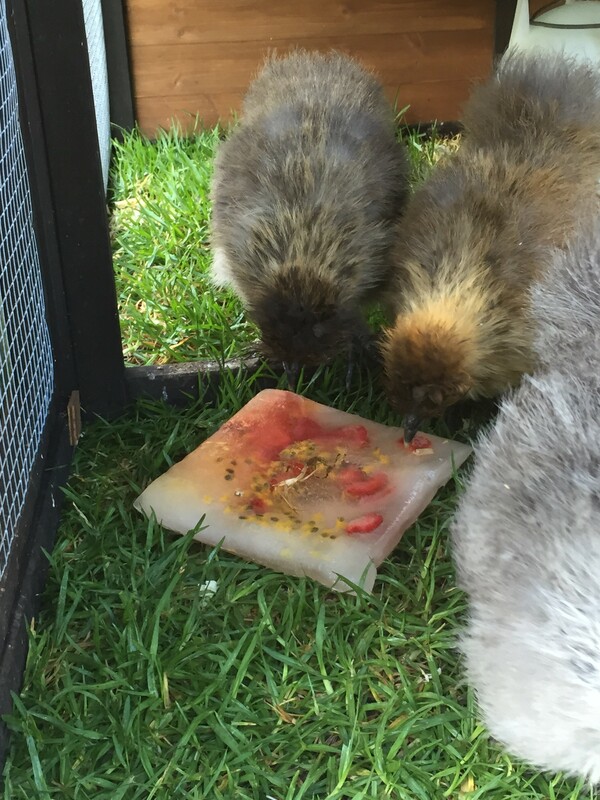 Some fruit has been frozen with water to make a large fruity iceblock for these Silkies to enjoy on a hot day. Healthy birds free ranging on short grass is the ideal situation. Strictly speaking however, chickens are not grazers. While they will eat grass, they can be prone to crop impactions if they overeat on long grass or lawn clippings. Lawn clippings go mouldy very quickly and should never be fed to chickens. Shell grit is a useful source of additional calcium and can be offered ad lib. Chickens have a high water requirement and should always have access to plenty of clean water. Intake will increase in warm weather, sometimes substantially. Clean and replace water daily. It is a good idea to have a second back up waterer in case of a malfunction/breakage. Plastic waterers will deteriorate over time and crack but I prefer these to the galvanized type which rust and cause birds to ingest heavy metals. Free range backyard chooks, that are fed a good quality pellet and access to fresh greens make the best looking yolks! Meat or animal products of any kind – This is illegal! The reason for this is that animal products can spread diseases. Swill feeding of animal products has been implicated in outbreaks of diseases overseas such as the Foot and Mouth disease. Australia has very strict laws about this to reduce the chance of similar outbreaks occurring here. However, commercially prepared meal of animal origin can be fed as it is treated to a point which prevents disease transmission. Avocado – Persin in Avocado acts as a cardio (heart) toxin in birds. All parts of the plant/fruit can cause poisoning. Onions/Garlic – Can cause anaemia and associated illness. Spoiled food – if it could possibly make you sick, it could make your birds sick. Compost – Chickens should not have access to compost heaps as they contain rotting vegetation with high levels of bacteria and fungi which may cause illness in your birds. Some people use chickens to turn over compost heaps, but in reality all they will do is spread the heap level.